In resistance to the plan of Shincheonju Church of Jesus, the Temple of the Tabernacle of the Testimony (Shincheonji) to build a museum on a large site in Cheongpyeong-myeon, Gapyeong-gun, Gyeonggi-do, local church and citizens’ groups are acting to guard their area through various events including a seminar on cults and a walking rally. Shincheonji is campaigning for public support, arguing that a museum will benefit the local economy. After the seminar, 1,100 some local church members and citizens took part in a walking rally (photo) sponsored by Cheongpyeong Citizens Solidarity For Shincheonji Countermeasures. Departing from Cheongpyeong Church, they proceeded to the museum construction site in Cheongpyeong 4-ri, holding pickets that read “Memorial to Shincheonji founder on scenic Cheongpyeong land? 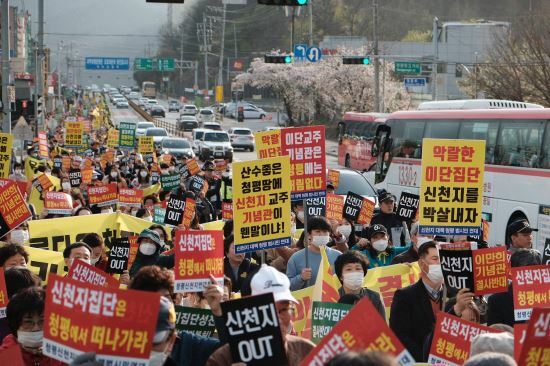 No way!”, “Cheongpyeong citizens are not fooled by Shincheonji group’s holy-land drive” and other slogans, and shouting their refusal to allow construction of the Shincheonji museum. Since April 7, Shincheonji members have been distributing leaflets in Cheongpyeong-myeon with the message “If we build a peace museum, not a religious facility, it will help the local economy,” and engaging in activities such as street cleaning, in an effort to overturn negative public opinion. A Shincheonji rally on the 15th mobilized 2,000 believers.